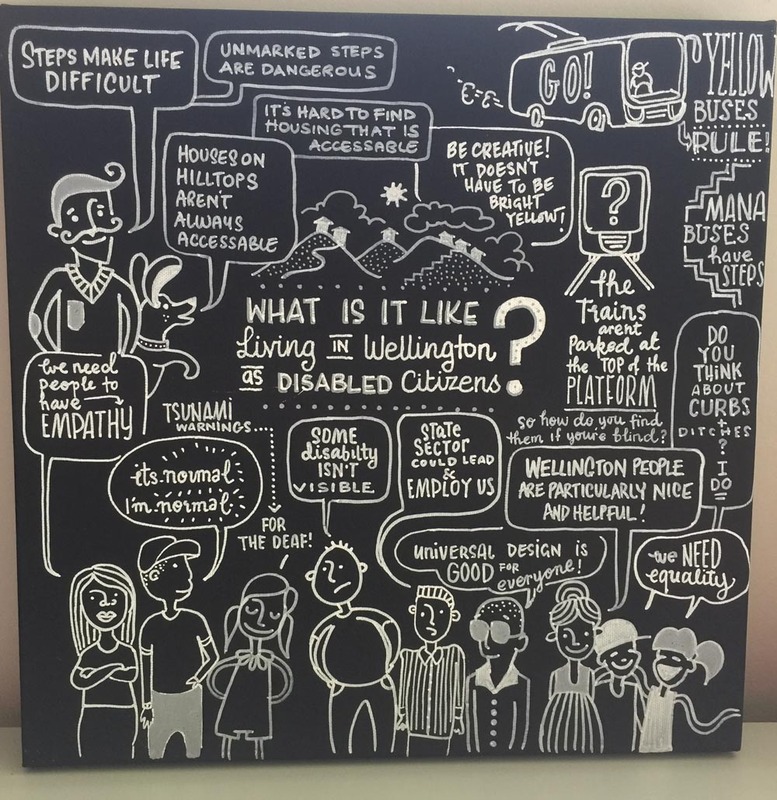 Wellington is a great place to live in, and people are particularly nice and helpful, according to disabled Wellingtonians who gathered on the International Day of Disabled People on Saturday 3 December. 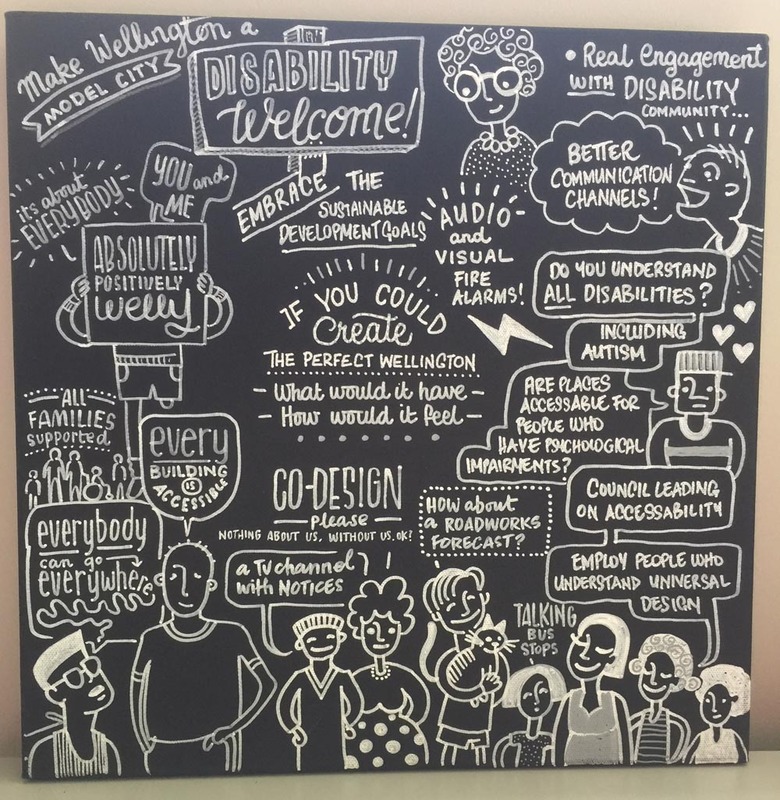 The conversation focused on living in Wellington based on our experiences as disabled people. The Wellington Through Our Lens event was organised as part of Disability Pride Week in conjunction with the Wellington City Council Accessibility Advisory Group. 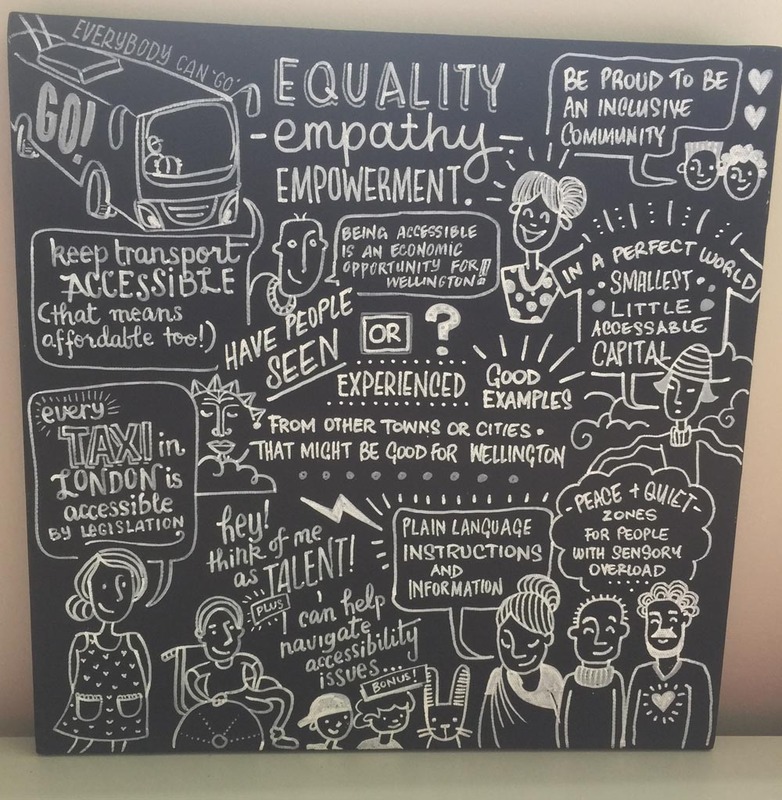 The messages from the group were captured on canvas by the League of Live Illustrators. There was a reminder that not all disabilities are visible; that equality is important; and that empathy goes a long way towards creating an environment that works for all its citizens. The realities of Wellington’s hills, steps and the lack of accessible housing brought with it a call for universal design to be widely adopted within Wellington. People at the event called for Wellington to be a model city where everyone can go everywhere; where every building is accessible; and where there is an enriched absolutely positively Wellington. To achieve this, Wellington City Council is encouraged to take a lead role; embrace the UN Sustainable Development Goals; and practise real engagement and co-design with the disability community (all disabilities, including autism and psychological impairments). Practical suggestions were also offered. We also said that this work is important not only for us but also for our families. People were asked about good examples of accessibility from other places. They talked about having plain language and accessible instructions and information; legislation that enforces accessibility; and the establishment of quiet zones. Equality, empathy and empowerment are priorities, and a place where being an accessible and inclusive community is seen as one that creates economic opportunities. In this environment, we are seen as people with talents too. The pictures will be presented to the Council early in 2017 as a visual reminder of our aspirations. This will inform the new accessibility plan of the Council’s Accessible Advisory Group. Rachel Noble MNZM was the co-convenor with Nick Ruane of Disability Pride Week 2016. She is Director of ennoble. Original generation time 1.2252 seconds. Cache Loaded in: 0.0285 seconds.